Life happens. It’s what we choose to do with it that matters. We can continually deal with what it throws at us, take a side step and live in denial, or step up and make a shift. Ask yourself, “What are three options?”, toward every situation. Then take a step toward what’s best. I’m a country girl, and love country music! Being young at heart, my fav artists are Brad Paisley, Luke Bryan, Chris Young and Keith Urban. These guys sing about love, having fun, enjoying a simple life and getting through the rough spots. These are not your, “Let’s get drunk and shoot Mama, or push her off a train,” kinda guys. Their songs will make you smile. Keith Urban actually laughs during some of his songs! One song in particular by Keith opened my eyes to endless options of what we can receive from life. A Little Bit of Everything. The beginning of the song, Keith mentions hanging a disco ball from an old oak tree. 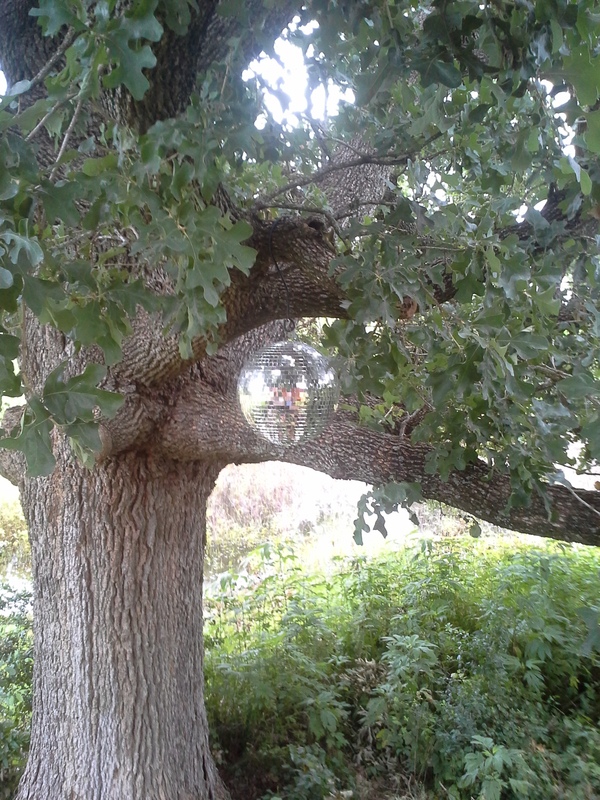 Having an old oak tree in my backyard this worked for me! Why not? Participating in a Letting Go Workshop, we learn to ‘Let Go’ of what is not serving us or anyone around us. I collected a lot of material and mental debris over the years. When it became obvious it was time to start downsizing my home, I would have never guessed it was going to take me where I am today. A lot of time, energy and money go into maintaining a large home full of stuff. What if that same time, energy and money was available again? What would that look like? If my plate is full, or overcrowded, that doesn’t allow room for anything new! God has cleaned my plate many a time over the past 10 years, and there’s always change involved. I live in a house that is 5 times smaller than where I began. The material items are minimal, but each one brings me joy! The same amount of time spent to clean one bathroom before, is spent cleaning my entire house today. I have time and freedom which is precious. 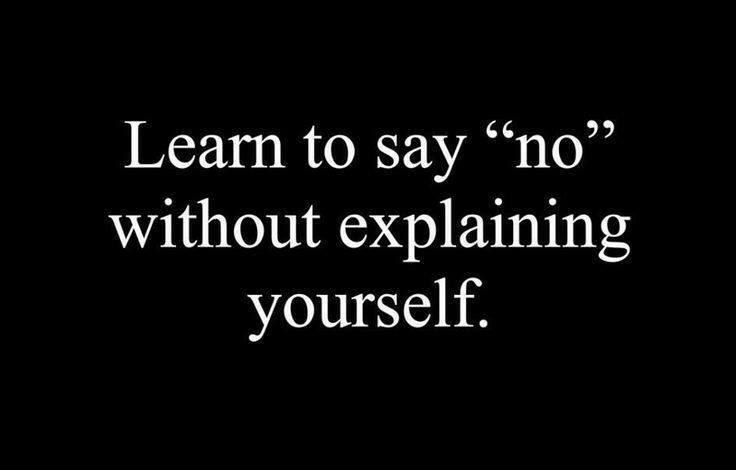 As I was going though The Letting Go process, I realized these methods would continue to serve me throughout everyday life. The downsizing of material things showed me there’s a huge difference between want and need. What brings you joy? I love to go Antiquing. Traveling through charming little towns in Texas, and stopping in these lovely shops is relaxing and brings me joy. I don’t make purchases at every shop because today my focus is quality of life, not quantity. Once in a while, something will speak to my heart, and I’ll stop and ponder if I have to have it. My daughter always asks me, “Do you love it?” Some shops believe in quantity, so if I spot a set of plates I like, I keep moving if I have to purchase the entire set. My life today doesn’t require a seating for 12 people. 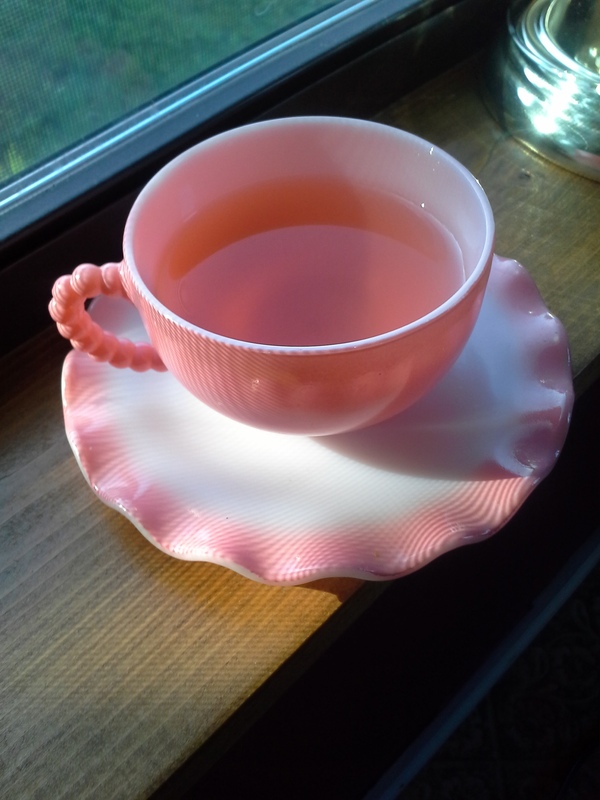 Recently, I came across a set of tea cups, plates and saucers that made me smile. There were four of each piece, which is perfect for my daughter and me. That gives us enough to have a guest or two, allow for breakage, and we’re not married to it because of investment. We have several sets of four plates, place mats, and cloth napkins to enjoy. This is another one of life’s simple pleasures. It’s been over a year since I’ve purchased paper napkins! Antique shops have beautiful cloth napkins, and there again, stay away from the set of twelve. Buy four or six, to change out regularly and enjoy the colors and patterns. Throw them in the wash, and they continue to bring you joy! A little bit of everything is better than too much of anything. I love cloth napkins! And your tea cup and saucer is wonderful!